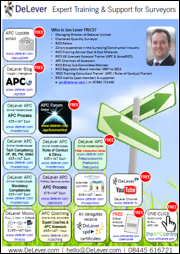 Hello… You can now download our NEW DeLever APC Support and Resources Flyer. Find out about all of the things we can do to support you and get you through your APC. Some bits are FREE and some you have to pay for. But there are loads of resources to help you along the way. BUT of those we mentored (at all different stages of their APC) we achieved a 80% PASS rate. Now that made us VERY HAPPY. Just think what we could achieve if you came to us right at the beginning of your APC journey..! So, feel free to download our DeLever Support and Resources Flyer and grab the FREE stuff today. You’d be mad not to. I am currently running my APC presentation at 11 to 12 minutes… Will I fail…? Answer : The RICS APC Candidate guide clearly states that your presentation should be 10 minutes. Assessors are trained on this guide and follow and read this guide to the letter so you MUST NOT present longer than 10 minutes. If you choose to ignore this guidance then it is likely that your APC Final Assessment Chairman initially will inform/remind you in the interview opening statements that you have only 10 minutes and should you run over the Chairman will, politely, cut you short and ask you to conclude in 30 seconds. This does not do much good to your general well being and stress levels, as not achieving one of the first milestones in the interview can have a drastic effect on the rest of the interview and increase your stress levels so that mistakes start to be made. Therefore, I cannot stress strongly enough that you MUST NOT run over 10 minutes and if you do this could go against you in the final PASS or REFER decision. If you simply consider the APC Candidate guide to be a literal representation of the client’s brief, then you will have exactly the right mind-set as you need to follow the RICS APC requirements to the letter. 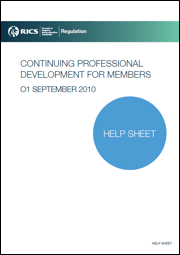 On 1 January 2013 RICS brought in their new CPD Rules… You should read these in addition to the existing CPD Helpsheet. 1. All RICS members undertake a minimum of 20 hours CPD per annum. 2. Of the 20 hours at least 10 hours must comprise Formal CPD. The remainder can comprise Informal CPD. 3. All RICS members must maintain a relevant and current understanding of RICS professional and ethical standards during a rolling three-year period. Any learning undertaken in order to meet this requirement may count towards Formal CPD. 4. All RICS members must record their CPD activity using the RICS CPD Management System (available to all members globally from the RICS website). As a chairman of assessors, these are the sort of questions I would ask you? 1. General principles of CPD? 2. Why we have CPD? 3. What is informal and formal learning? 4. What CPD are you planning to do in the near future? 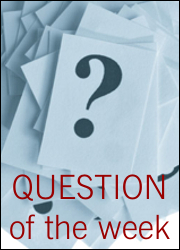 Note: This is NOT an exhaustive list of questions! 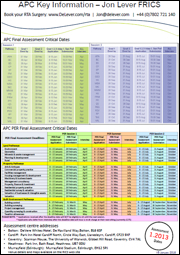 Answer : Firstly let’s just clear up one thing at the outset and that is the APC Final Assessment IS NOT AN EXAM. It is an EXPERIENTIAL BASED ASSESSMENT which is quite different. I find a lot of candidates think it the APC is something you can revise a few weeks before and hopefully your questions come up. This could not be any further from the truth! Level 1 – Know the ten steps to complete the process and be able to discuss each step from a knowledge and process perspective. Know the principles, parameters and key criteria without having to go back to the books or codes of practice etc. If you treat your panel as if you were attending a progress meeting with a Lay Client and that you are on your best professional behaviour with your client’s interest foremost in your mind and able to explain and discuss yourself professionally and succinctly you won’t go far wrong. I sat and achieved my APC Final Assessment and Chartered Status nearly 20 years ago and I am as proud today as the day I achieved it and I believe that is what it is all about it is a mindset that should always be growing and developing ensuring that everything we do is done to the best of our ability. Question: What exactly IS a ‘New Years Resolution’? Answer: It’s a TO DO list for the first week in January! We wish you all a brilliant and prosperous NEW YEAR and look forwards to supporting and working with you for longer than the first week in 2013! Enjoy the remainder of your holiday and we’ll be back in action on the 8th January 2013.